Happy Monday everyone! Are y’all still full of turkey, dressing, and pumpkin pie? We had a bit of a non-traditional Thanksgiving dinner: steak, rice, and carrots. We still had our typical crescent rolls, pecan pie, and pumpkin pie, though. Can’t give those up! 🙂 I hope all of you had a lovely and blessed holiday. Congratulations to Amy Linderman, who won last week’s giveaway. Now, onto this week’s! 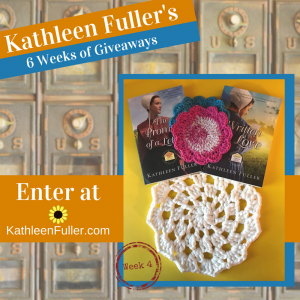 Week 4’s Giveaway is another gift for the kitchen–a hand crocheted trivet and two flower dish scrubbies, along with copies of Written in Love and The Promise of a Letter. Winners will be announced on Monday, Dec 4. The next contest will also be posted on that day.